A newspaper drama based on real events, Spotlight recreates the Boston Globe's investigation into child abuse by Catholic priests. With a quality cast in good form the film sustains a steady level of engagement, without fully breaking away from the constraints of a well known story. In 2001, Marty Baron (Liev Schreiber) is hired as the Globe's new editor. 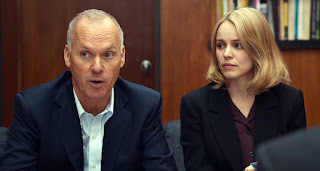 He quickly authorizes the investigative Spotlight team, led by Robby Robinson (Michael Keaton) to dig into accusations that a Catholic priest named Geoghan was a serial sexual abuser of children, and that Boston's Cardinal Bernard Law (Len Cariou) knew about the incidents and did nothing. Robinson's team consists of reporters Michael Rezendes (Mark Ruffalo), Sacha Pfeiffer (Rachel McAdams) and Matt Carroll (Brian d'Arcy James). 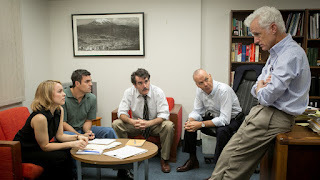 Assistant Managing Editor Ben Bradlee Jr. (John Slattery) supports the investigation while warning that the Church will mobilize to push back against the newspaper. Rezendes establishes contact with scrappy lawyer Mitchell Garabedian (Stanley Tucci), who is fighting a lonely battle representing multiple former child victims of abuse by Catholic priests. Robinson and Pfeiffer pursue lawyers who have defended the Church behind the scenes to keep the abuse accusations away from public scrutiny. Gradually victims come forward to share their stories with the Spotlight team, and it becomes apparent that many more priests were likely engaged in abusing children. With the sensational exposé taking shape, the terrorist attacks of September 11 derail the publication schedule, and pressure mounts on Robinson to avoid rocking the boat of Boston's established society. 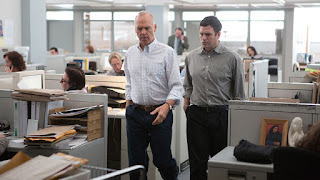 Directed by Tom McCarthy, Spotlight draws its energy from the familiar theme of crusading reporters committed to a cause. The film is an earnest treatment of a sensitive subject, and the script by McCarthy and Josh Singer covers all the angles, including victims, lawyers, priests, reporters and Boston's power brokers. Some want the truth, others justice, while the elite circles where the church, money and tradition intersect just want the whole story to be swept under the carpet. Very much a galloping talk fest, the script does pack in a large number of names, referrals and sources with short roles, and it's sometimes difficult to keep track of all the players. There is even a subject matter expert only available over the phone, psychotherapist and priest researcher Richard Sipe (an uncredited Richard Jenkins) offering crucial insights based on years of research, but never seen in person. The few scenes of action try to generate drama from the mundane pursuit of documents in the bureaucratic maze of government offices, where the hours are short and the red tape thick. Spotlight's best moments are when the reporters pause and allow the enormity of the emerging story to wash over them. Emotions flair between Robinson and Rezendes in a disagreement over timing, Rezendes and Pfeiffer discuss what the church meant to them, while Carroll finds the scandal residing closer to his home than he would like. Robinson has to face his own history as a reporter, a case of present-day success revealing yesterday's imperfections. McCarthy also ironically humanizes Baron by keeping him cold and aloof. More of these interludes would have made Spotlight even better. The theme of an outsider having the courage to lift the lid over an established but corrupt order resides at the of the film. Baron is a Jew, a newcomer to Boston, and has a resume that suggests he won't stay long at the helm of the Globe. He is presented as a fascinating character but unfortunately drifts towards the edges of the film, his influence only tangentially hinted at while the focus resides with Robinson and his team. Keaton, Ruffalo, McAdams and James get on with the job of portraying reporters without much fuss, Ruffalo getting the most animated role. The supporting cast is loaded with interesting performances. Liev Schreiber is cool and cold as Baron, Stanley Tucci ruffled and exasperated as the lawyer Garabedian (another self-aware outsider), and Billy Crudup makes a welcome appearance as Eric MacLeish, the slick lawyer with a scripted message and much to hide. Spotlight celebrates the still relevant power of old-fashioned reporting to drag a tragic scandal into the open. The reporters get the satisfaction of a job well done, but the real beneficiaries are the unnamed vulnerable children of the future whose lives may have been made that much safer.